The Dividend Drive: SELL: SSE (SSE)--Where have all the customers gone? SELL: SSE (SSE)--Where have all the customers gone? This is a first. The first time I have sold a stock of my own volition (I sold Amlin earlier this year after they were acquired). 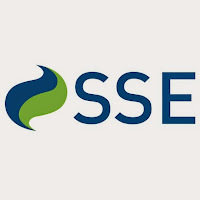 Many of you may be surprised to see it is the FTSE 100 utility giant, SSE which has gone. I have held SSE since January 2014. All in all, I have been very happy with it. In fact, it has done exactly what I demanded of it. It quietly and efficiently got on with its business and generously threw some hefty dividend payouts my way. Indeed, my yield on cost was running at 6.7% at my point of sale. Nice. But now I have sold out of my position. Why? Well, we will circle back to why in a moment. First, let's deal with the sale itself. I picked up SSE when they were being bludgeoned by political posturing about utility bills. This posturing was very shortly toned down to such an extent that I don't think I have actually been in the red capital wise with this investment. So what was my return? Well in pure capital terms I booked a solid if unspectacular 8.6% gain (including transaction fees). Throw in dividends and I saw a return of 19.26% in total. Not bad at all. From an annualised return perspective that is a 4.79% capital return per year and 10.72% total return per year. I am pretty happy with that especially considering the safety and lack of volatility of the investment over that period. Of course, If I had sold back in June at 1650p when it was near its 52-week high those figures would have been much more impressive. Which brings us back to the question of why I have sold out now. So why have I sold? Some of you are most likely thinking it is due to the prospect of interest rate rises. You're sort of right but largely wrong. Recently the prospect of interest rate rises in the US and UK have increased. As such, many people have started to assess their investments in light of this. SSEs share price is, perhaps, more susceptible to interest rate hikes than others. First, it is seen as a bond proxy. Consequently, its dependable earnings profile and hefty yield is extremely attractive when bond yields--courtesy of low interest rates--are measly. With the prospect of interest rates (and thus bond yields) rising these companies become slightly less attractive. Second, it does have a fairly significant debt burden. At last calculation, it had a debt-to-equity ratio of 1. This is on the higher side. That being said, it is much lower than its utility peers--electricity, gas and water included--who all have figures north of 2. Neither of these are what are currently worrying me though. Indeed, I continue to hold utility peer National Grid even with a higher debt burden and perhaps an even more robust status as a bond proxy. Undoubtedly, this sale may have been helped along by its bond proxy status in that perhaps more cash was ploughing into SSE than would ordinarily be the case lifting its price to a level I found attractive to sell at. Nonetheless, it was not my reason for selling. There was a bigger worry. What is that worry? It is the retail customer numbers. Up until 2011 there was a solid rate of customer growth at SSE. From then, however, as you can see they have been pretty noticeably losing customers. In fact, since the 2011 peak they have lost nearly 13% of their customers and are back to numbers below the 2008 level. What is more, this loss of customers seems to have sped up of late. Since I bought into them in January 2014 they have reported yearly losses of 3.91% and 5.71%. What is more, 2016 is looking little better. At Q1 results they reported customers at 8.49 million. And then, at H1 we find it dropping further to 8.41 million--already nearly 2% more losses. This is just not good enough and worries me greatly. Over the full-year it is expected that SSE will report a decline in profit in Domestic Energy Supply as a result of lower customer numbers. Fine. But how are you looking to reverse this, I ask? The only thing I have noticed of late is a somewhat baffling advertising campaign they have engaged in involving an orang-utan (I was not the only one puzzled by the advertising campaign, read the New Statesman). The increase in operating profit in Retail, restoring it to a level similar to that achieved in 2012/13, followed an increase in household electricity and gas tariffs in November 2013 and reflects a number of factors, including operational and cost efficiencies, which were partially offset by the impact of mild weather and a reduction in the number of customers. What does this mean? First, that they only just got profit levels back to 2013 levels. Ok, at least they are back there. But it gives the impression of pushing against strong headwinds. So, how did they achieve this? Chiefly by gas and electricity tariff hikes as well as cost efficiencies rather than increasing customer numbers which were actually going southwards. I think you can see my issue here. If you increase tariff you are unlikely attract new customers but without the new customers you are going to need to hike prices to keep growing profits. Something surely has to give. Now, I also know that their retail customer base is only one part of their sprawling energy provision universe. In fact, at preliminary results time it only represented about a quarter of profit. Half of profit came from its networks and another quarter from its wholesale operations. Nonetheless, a quarter is still a lot. What is more, with a dividend increasingly pressured (covered only about 1.24 times by predicted earnings this year and next) they have little leeway from an investors point of view. Without success in reversing this now long-standing decline I seriously doubt they can maintain their dividend comfortably let alone grow it. Of course, they continue to reaffirm their commitment to dividend growth above inflation. This certainly eases concerns in the short-term. But how much can we trust it? We heard the same with Centrica just before their February announcement of a dividend cut. At their interim results just before they had "reaffirmed" their "commitment to real [that is, above inflation] dividend growth" and signalled this commitment with a 4% interim dividend hike. A few months later the dividend was cut a third and the share price dropped from 281p per share just before the announcement to the c.230p per share today--about 19% lower. I am not saying that a cut is imminent. SSE is very different to Centrica. Without the massive exposure to gas and oil exploration, SSE is a far more stable earnings company. However, that does not mean it is impervious to a cut. However, without an obvious catalyst for improving customer numbers or other similar good news I find myself feeling a bit uneasy. Sure, the generous dividend feels like a worthwhile risk in many ways. But if a cut did come I would be short of dividend yield and--assuming a similar 19% share price drop--showing a capital loss as well. The time, therefore, felt right for me to step away from my SSE investment. Future for DD and SSE? Don't get me wrong. I like SSE as a company. I still see a future for SSE in my portfolio. However, at the moment I can't see a good justification to keep them in my portfolio. Until I see something akin to sustained customer growth or at least a logical plan for bringing this about I will remain loathe to reinvest. A dividend cut may even be welcome as part of this if it is used to increase advertising, customer service quality or reduce retail prices to entice customers back. Without such a catalyst or green shoots of customer growth I remain concerned about the safety of SSEs dividend which, of course, is its main appeal. Consequently, I have to reluctantly take my money elsewhere. What do you think? Are you loading up rather than selling out of SSE (or indeed other utilities)? Have you sold out of any investment recently for similar reasons? Probably a good move to get out whilst you are ahead. As you say the loss of customers is a worrying trend. I sold this one in 2013 as I was concerned about the high gearing and the fact they were paying around a third of the high dividend from borrowing - not a good sign. I recycled the proceeds into Unilever - lower yield but ahead on total return basis. I hope you find a good replacement for your portfolio - I am sure Mr Market will throw in a few tempting offers. I bought in as they were very attractively priced but said to myself to begin with that without customer stabilisation at least I would have to reconsider my holding. After nearly two years with continual customer losses I thought it was time to follow my own guidance. If I had got out in June (I was tempted but thought I would give them a little longer) it would have been a superb profit for a utility. Nonetheless, as it stands it was not bad! The gearing was less of a worry for me, it must be said. Certainly it is high relative to the market. But compared to its peers it was rather modest. Paying the dividend from borrowing, however, is far more concerning. you were right to jump ship then. I do think a dividend cut would, actually be rather welcome for investors. Indeed, if they chose that course I would seriously look at them again. Fundamentally it is a very attractive company. I am unsure where to put my funds at present. A top up of my Old Mutual holding looks tempting after recent share price weakness. Equally, opening a position in Greene King is tantalising. I am not really sure at the moment! I may even consider pushing it towards some more US investments as I would like that to reach about 5% of my portfolio at some point with my long-term eye towards the potential disruption from the EU referendum. as you say, NG. is even more of a bond proxy than SSE, hence I make allowance for these types of factors. maybe i missed it, but what did you/will you put the sale money into?! Glad to hear it! Sounds like your value screen is working well! I have not worked out where I am going to direct the cash as yet. As I mentioned to DIY above, maybe Old Mutual or Greene King. Though I am far from decided. I may sit on the cash for a little while. I don't think any of the companies I am interested in have ex-div dates coming soon which leaves little rush! SSE was on my radar recently, but as I have NG already I decided to let it slide. Did buy OML (started a position at 200p) and instead of SSE I waited for United Utilities to reach the 950p mark and started a position there too. Competition for water supplies is less fierce than standard gas/electricity, and despite debts (but utilities are normally in debt), it sounded like a more "safe" investment. Surely the next years are going to put pressure on Reits and Utilities, but I do value them as bond proxies, I am not expecting splendid growth or anything like that bu a stable constant return. NG will I think look even more attractive soon for long-term investors as it share price starts to return to normal levels. I look forward to topping up when I can! I think I am going to largely hold off from utilities for a little while until the interest rate dust settles a little. Some US utilities look pretty solid though with low debt. I'd like to add a water utility (Pennon is my favourite) but they look too expensive at the moment with uncertain short-term prospects. I will sit on the sidelines for now! OML around 200p is a pretty good price in my mind. Hence why I am considering pushing my funds in that direction. We will see! Yes, I did not really expect much if any capital appreciation from SSE when I bought into it. Glad to take what is offered though! You're right that REITs and utilities may have a period of underperformance coming up. But that is fine, long-term they still look good. I will have a further look at the market tomorrow. Thanks for sharing! Number of customers' growth is always an important element for evaluating a company's prospects. Personally I prefer buying and holding commercial banks' shares, but before I do so, I often do some research to know more about its customer satisfaction. Besides, I will never buy a bank's shares if it often retains profits by firing its staff. Thanks, Cherry. Yes, without a reverse of the loss of customers I can't see anything good coming round anytime soon! I will keep an eye on whether they can make some positive progress! Very interesting write up. When the customers start leaving, the investors should as well. Thanks, Ben. Glad you found it of interest. Yes, they have clearly failed to get to grips with the issue. I had hoped they would at least stabilise numbers by now. But nothing yet! Hence why I did end up following the customers! Great analysis DD. Not a holder, but was a customer for years till earlier this year. Almost £400 cheaper per year with my new supplier on a dual fuel tariff. Sounds like they're getting their pricing strategy all wrong. Especially fatal considering how easy it is to compare and switch suppliers now - or at least was for me! It seems you were in good company shifting away from them. All of the Big Six are losing customers. RWE (that is, nPower) lost another 100,000 customers in the last quarter and that was from a lower base. As you say, it is much easier to move nowadays as well which means that hiking prices is really not an answer. Maybe short-term it will solve the problem, but long-term this is certainly not the case. Just makes new problems! We will see how it all pans out. But the Big Six look less robust than they have for some years. Good analysis and reason for selling - SSE is still on my list to buy but doesn't feature near the top. Greene King has been in the news lately in a positive fashion - sales going through the roof in China ever since their president had a pint with David Cameron during his recent visit! It was a hard decision in a way. As I say, it is a high-quality company in an attractive industry with a management I, generally, have huge respect for. I just could not ignore their failure to address the customer problem or at least look like they are. If they can sort that out (amongst other things) I will be back on board! Yes, I saw that news on Greene King. Very interesting. I wonder whether they can turn that into a mature large market in China. It is possible, but they have to act well in response. We will see. Very intriguing to see how that pans out for them!